Unlike national ads that could be relevant to any consumer, anywhere in the country, hyperlocal marketing zooms in to focus on more specific areas, even narrowing strategies down to individual city blocks. A newly opened brewery, for example, can use hyperlocal marketing to make nearby consumers aware of their presence and to drive traffic. They could use geofencing to target patrons at a local bar with a special offer during opening weekend and highlight their locally brewed craft beers that aren't available anywhere else. When Should You Use a Hyperlocal Strategy? Effective hyperlocal marketing should incorporate a few different campaigns, especially in the early going: You want to test various channels and see which approaches are the most cost-effective. Retargeting can be deployed on a variety of ad networks, through social networks, and in mobile apps. And ReachLocal notes that hyperlocal paid search advertising can target consumers within a given radius who are searching for things related to your business or the products and services you offer. 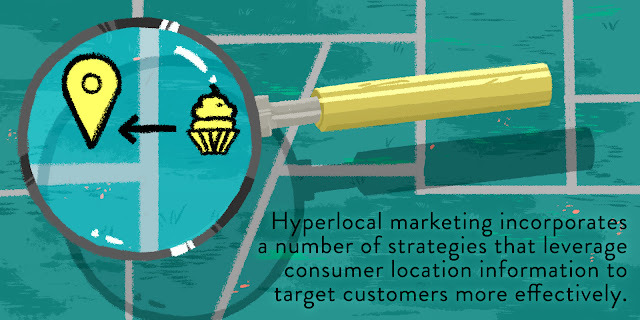 In many cases, hyperlocal strategies can be deployed as an extension of an existing marketing strategy. Many companies already use Facebook and other social media platforms to advertise to consumers, but location-based information—driven by check-ins and other user data—can help identify nearby consumers whose interests align with your company. Street Fight tells the story of how a Dallas, Texas-based bakery called Trailercakes used paid ads on Yelp to effectively target local customers. The paid ads placed the company at the top of relevant local searches where consumers were looking for baked goods. Meanwhile, in-app and mobile browser ads can leverage location information to run campaigns based on consumers' proximity to a business or other point of interest. A retail mobile app could alert nearby shoppers to a surprise discount that can only be unlocked by visiting the store. Once inside the geofenced area, consumers can check the apps again to see what promotion they've received. Through a store-specific hyperlocal campaign, you can provide a unique local experience that someone has to enter the store to enjoy. The more specific you can get when targeting based on location, the more personalized these strategies will feel, giving you a chance to curry positive interest from relevant consumers. How Does Hyperlocal Improve ROI, and How Do You Measure It? Some types of ROI are easier to measure than others. Conversions and sales offer clear-cut numbers to analyze. Brand lift, on the other hand, is a bit amorphous in terms of its monetary value. So marketers measuring hyperlocal ROI have to balance the tangible metrics against indicators of value that can have a little bit of wiggle room in them. However marketers choose to measure their hyperlocal ROI, one thing is clear: Nearly all of them think it's worth the effort. According to the ClickZ report "The State of Mobile Advertising 2016," both client-side and agency-side marketers are seeing positive ROI across a broad range of hyperlocal campaigns. However, only 22 percent said they were using hyperlocal to its full advantage, so there is much opportunity still to be had. ROI is a combination of hard data and educated guesses. In Trailercake's case, incentivized mobile check-ins through Yelp helped create some tracking possibilities to pin down some ROI. The numbers aren't perfect, but the bakery's owner says that just this limited set of data proved her hyperlocal campaign was generating positive returns. Platforms like Yelp have a conversions estimator. Phone call referrals through Google are much easier to track, and the tools are built into Google Analytics. When online-to-offline referrals aren't easy to identify through analytics, why not try simply asking consumers how they were referred—or even offering channel-specific promotions to create incentive for this feedback? Ads through Waze's mapping technology, for example, frequently feature a discount coupon that can motivate consumers...while also providing an easy tracking tool. Very few consumers will forget to use their discount voucher if the voucher is what inspired their visit. In the end, hyperlocal offers a layer of personalization that consumers crave. They'll be drawn to the brands that give them what they want. And as hyperlocal becomes more common, a failure to adapt will prime businesses for consumer frustrations. 1. A strong hyperlocal strategy can improve the consumer experience. 2. A high percentage of marketers report positive ROI across different types of hyperlocal strategy. 3. Incorporate several hyperlocal strategies that utilize retargeting, proximity marketing, geofencing strategies, and local search ads.